An American health care worker providing medical assistance in the Democratic Republic of Congo who recently experienced potential exposure to Ebola has was flown back to the U.S. on Saturday and transported to a special biocontainment unit in Nebraska, according a hospital official, who stressed that the person has yet to display any symptoms of the deadly disease. While U.S. medical officials have declined to name the possibly exposed individual, numerous media reports describe the person as a doctor. ABC News could not immediately confirm this. Ebola Virus Disease (EVD) is a rare, deadly disease that can be transmitted through direct contact with an infected animal or a sick or dead person infected with the disease, according to the U.S. Center for Disease Control and Prevention (CDC). There is no approved vaccine or treatment for the devastating disease, which can incubate in a person for three weeks before prompting initial symptoms, which can include a fever, sore throat, muscular pain and headaches, according to the World Health Organization (WHO). A Congolese health worker administers Ebola vaccine to a boy who had contact with an Ebola sufferer in the village of Mangina in North Kivu province of the Democratic Republic of Congo, Aug. 18, 2018. Vomiting, diarrhea and rashes usually follow, and the liver and kidneys can begin to break down, before – in some infected patients – internal and external bleeding begins, according to the WHO. This individual was monitored through the flight to the U.S., and to Omaha, at several different locations, and this person is not symptomatic after any of those checks. The person was also monitored after arrival in Omaha and was shown not to be symptomatic. The viruses that cause EVD are located primarily in sub-Saharan Africa, according to the CDC. 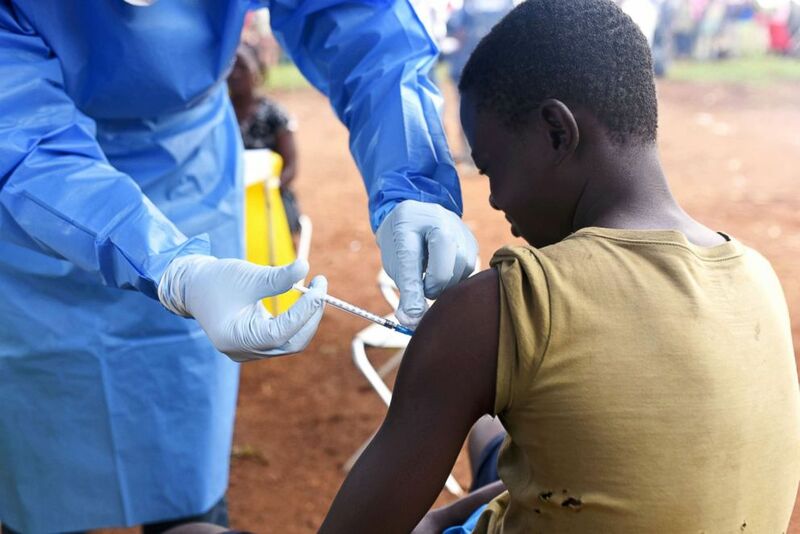 The Democratic Republic of Congo has been plagued by the second-largest Ebola outbreak in history, which began in August and has already infected more than 600 and killed more than 300. 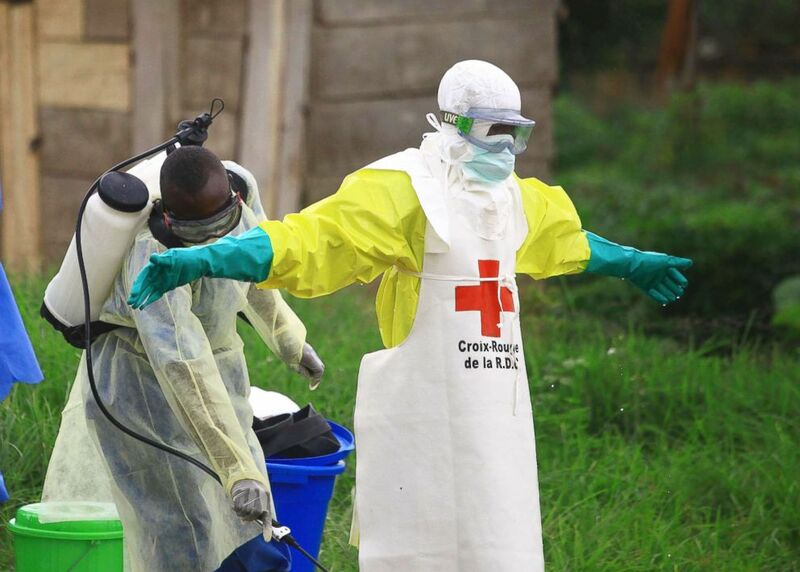 Health care workers from around the world have descended on northeastern Congo to help thwart the expansion of the outbreak. In this Sept 9, 2018, file photo, a health worker sprays disinfectant on his colleague after working at an Ebola treatment centre in Beni, Eastern Congo. But humanitarian efforts have been frustrated by violence at the epicenter of the outbreak, which has devolved into an active war zone. Nebraska Medical Center officials also sought to reassure the public that the campus’ medical community has the situation well in hand. “This person may have been exposed to the virus but is not ill and is not contagious,” said Dr. Ted Cieslak, an infectious disease specialist and associate professor of epidemiology at the University of Nebraska Medical Center College of Public Health, in a statement. The Nebraska Medical Center’s Biocontainment Unit is one of only several nationwide that was built and equipped for the specific purpose of housing and monitoring individual who suffered possible exposure to a deadly disease, according to Wilson. As of right now, this person is staying in a place especially designed for this purpose. The person, who was transported to the U.S. by private plane and transported by car, will be monitored by federal, state and county public health officials, according to the statement. 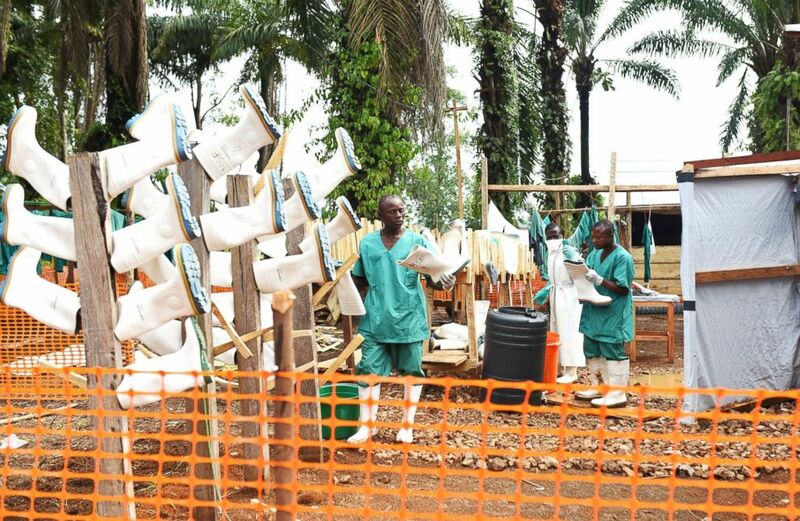 Congolese health workers clean gumboots as they prepare the Ebola treatment centre in the village of Mangina in North Kivu province of the Democratic Republic of Congo, Aug. 18, 2018. The Nebraska Medical Center treated three patients with Ebola in 2014, according to the statement, and the following year monitored several others after exposure, though none of those individuals developed the disease. Ebola was first identified in Congo in 1976. The deadly virus can infect a human in contact with monkeys, bats and other wildlife that make contact with a person’s bodily fluids.